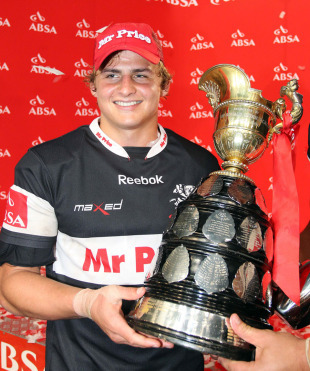 Patrick Lambie and Elton Jantjies have both been included in the South Africa squad for the end-of-year tour of Great Britain and Ireland. Fly-half Lambie was named in the travelling party just hours after scoring two tries and kicking 15 points in the Natal Sharks' 30-10 victory over Western Province in the final of the Currie Cup. His fellow 20-year-old Jantjies, meanwhile, has also been called up on the back of his own scintillating form in this season's competition. The pair are not the only uncapped players in the Springbok squad, however, with Lwazi Mvovo, Willem Alberts, Keegan Daniel and Coenie Oosthuizen also having been selected to tour. Overseas duo Ruan Pienaar and Frans Steyn have also been included in the 30-strong panel, which will be led by veteran lock Victor Matfield on account of the injury-enforced absence of regular skipper John Smit. "We've rewarded players for their form in what was a difficult selection as there were a number of others who were part of our preliminary squad who were very close to selection," South Africa boss Peter de Villies said. "But we looked at the players who were performing now in our selection criteria as we need to be on top form from the first kick-off in Ireland. It's a new-look squad but it has a good backbone of experience for what is going to be a challenging tour." With the Springboks set to play four Tests, it would appear likely that both Lambie and Jantjies will make their respective international debuts at some point. However, de Villiers refused to be drawn on exactly when he will throw the youngsters into the international arena. "It's difficult to say beforehand. We just have to sit now and try and get combinations going well for the first game and everything that happens there will determine what the next steps will be. For us now to say what's going to happen in the third week I think is premature." Backs: Gio Aplon, Bjorn Basson, Juan de Jongh, Jean de Villiers, Bryan Habana, Francois Hougaard, Elton Jantjies, Ricky Januarie, Patrick Lambie, Lwazi Mvovo, Ruan Pienaar, Frans Steyn, Morne Steyn. Forwards: Willem Alberts, Bakkies Botha, Schalk Burger, Keegan Daniel, Bismarck du Plessis, Jannie du Plessis, Alistair Hargreaves, Ryan Kankowski, Victor Matfield, Tendai Mtawarira, Coenie Oosthuizen, Chiliboy Ralepelle, Juan Smith, Pierre Spies, Adriaan Strauss, CJ van der Linde, Flip van der Merwe.